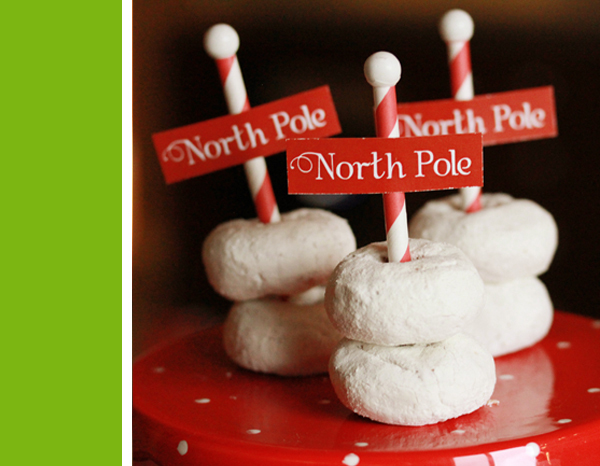 These North Pole cupcakes popping up everywhere are just darling. 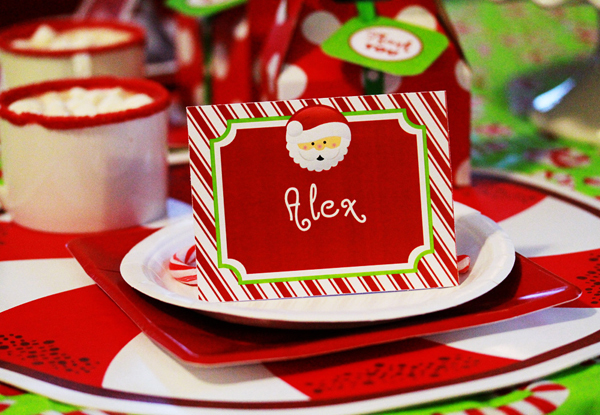 Take a look at my next party feature, a HOLLY JOLLY CHRISTMAS PARTY, submitted by Cathy Cattaneo of Five O' Five Design+Paperie. SO cute. I just love all the fun treats. Can't beat those reindeer peeps on sticks! Everything is just darling. 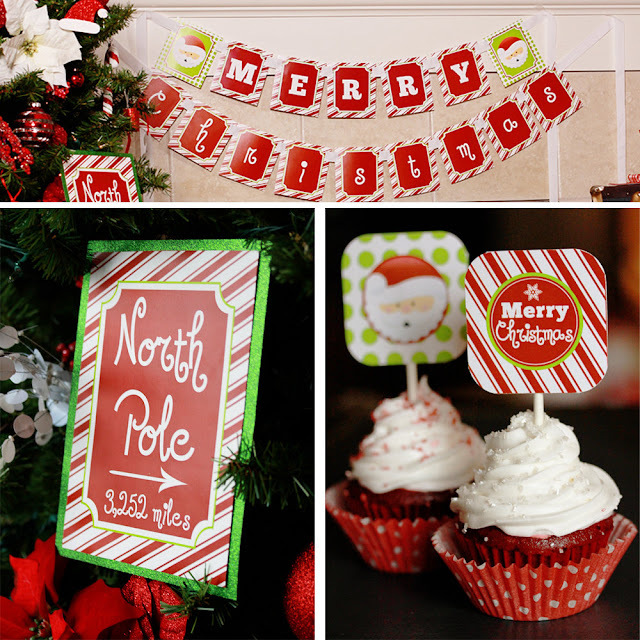 Here is what Cathy said about the party- "I created this party to display my new printable set and give some easy and inexpensive ideas for anyone hosting/attending a Kids Christmas Party this year. I wanted everything to be very lighthearted and child-like, of coarse Santa had to be included. Thank you so much to my good friend Monica of Andary Studio who captured the party perfectly and Tracie’s Sweet Treats for coming through at the last minute with delicious Red Velvet Cupcakes. 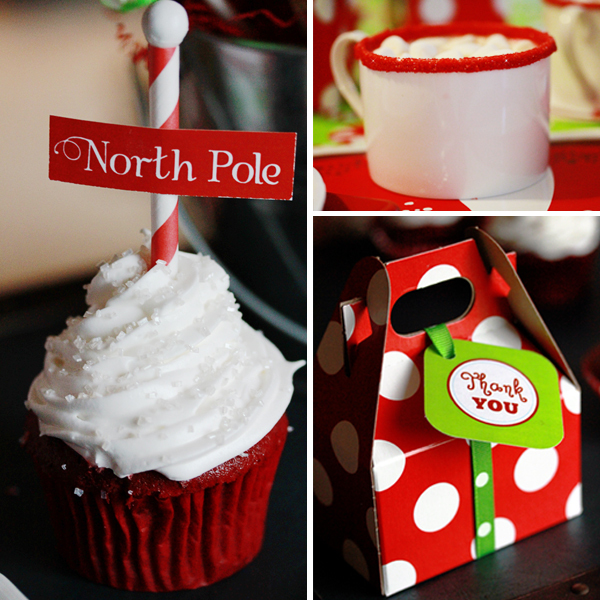 My main inspiration came from the adorable North Pole Cupcakes found on Kara's Party Ideas here. 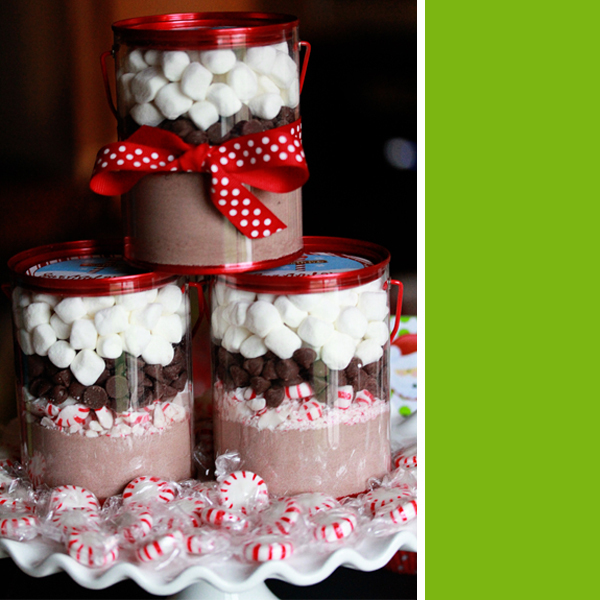 To create the hot coco cups simply dip the rim in red chocolate and then again in red sugar sprinkles. This can be done a few days in advanced to save on time. The milk bottles were Starbucks frappuccino bottles cleaned and wrapped with drink bottle label topped off with 2% milk & a red polka dot straw. The Rudolf suckers were chocolate Rudolf peeps on a lollipop stick – pretty simple but way cuter then throwing them on a plate. Milano Cookies were dipped half way in red chocolate and then dipped in crushed up candy canes/peppermints. The reindeer doughnuts were made with chocolate covered doughnuts, pretzels cut in half for antlers, white chocolate chips for eyes and red balls for noses – make sure you remove the noses before serving ;). 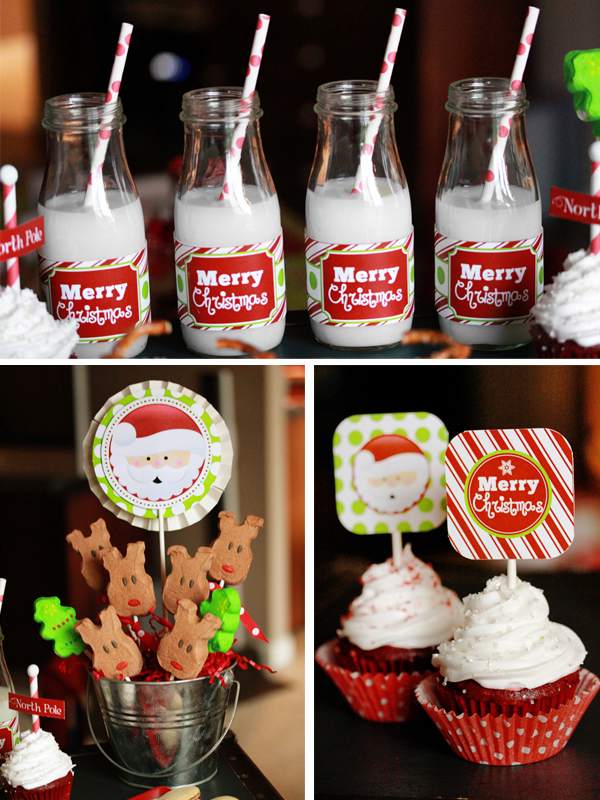 This party was created with mostly inexpensive store bought items displayed in a super cute way. Totals: The desserts cost a whooping $25. All in all the party was less then $100." 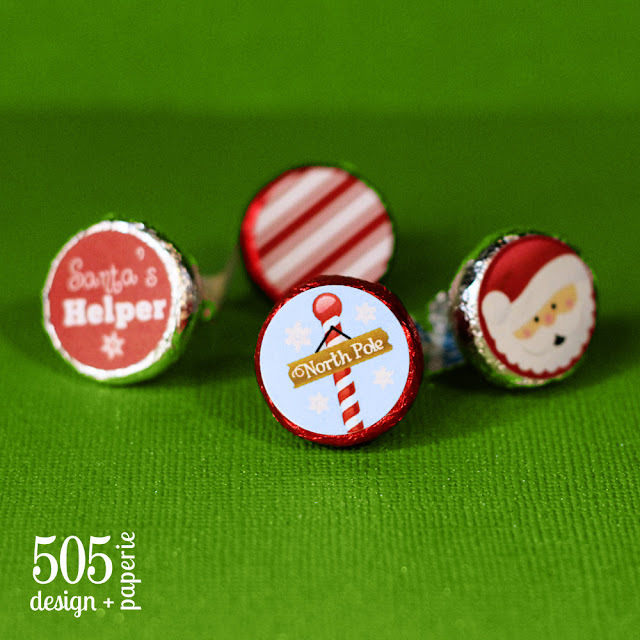 I absolutely adore all the details in this Christmas Post. So beautiful. Great ideas in that post! I am in love with this post. My favorite are the dipped Milano cookies. So cute. Those would be great to bring in to work. I know, isn't everything just darling? Thanks for your comments! It seams like real Santa definitely was attending this party :)Everything looks super jolly and festive. wonderful job putting this together. Thank you so much for sharing and all of your sweet comments!! I LOVE your blog so it really means a lot to be featured. 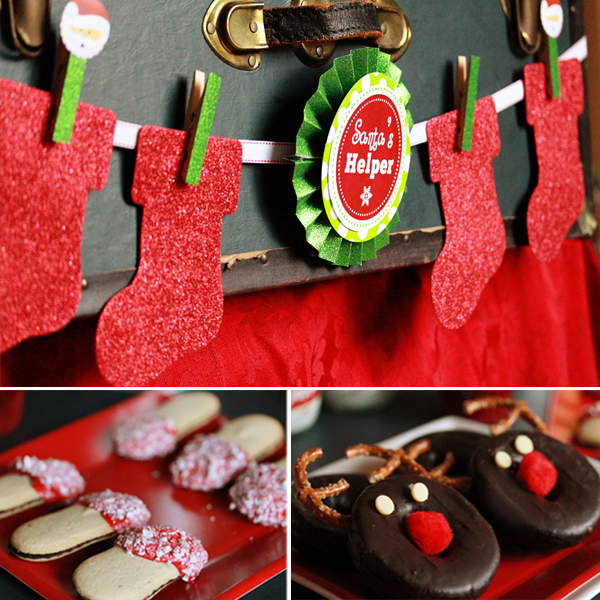 Love the "North Pole" powdered donuts and dipped milano cookies!!! So adorable. These are so cute!!! Do you have anything for bunch party's!